Situated in the Okanagan Valley with the beautiful backdrop of the Rocky Mountains, ARMSTRONG METALFEST, now in its ninth year, is British Columbia's largest gathering of metalheads from across Western Canada and beyond. "The team members of West Metal Entertainment poured their sweat and blood into making this year's line up for Armstrong Metalfest the best year yet! A large portion of this year's line up consists of bands who will be releasing albums in 2017. The fact that so many bands in Canada are able to write and record quality material is a real testament to the thriving metal scene we have. The band submission process is a grueling gauntlet of awesomeness, but personally I love every second I dedicate to the brilliant artists of Canadian Metal! 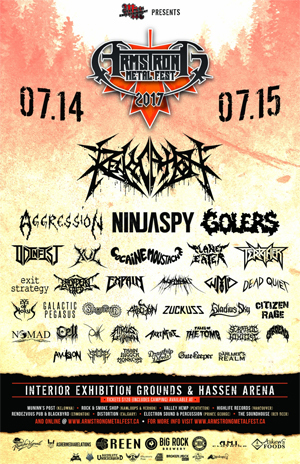 I am especially excited to have REVOCATION on this year's edition of Armstrong Metalfest. Their style is hella fitting for the festival and I know they will be well received! Also, their album Great Is Our Sin is fantastic front to back. I'll be front row center screaming my heart out for sure! I am very proud of the work our team has put into year nine of Armstrong Metalfest. Our work is paying off, so far this year we have broken every record for ticket sales we have ever had. As a community we built this festival from the ground up. As the festival grows, so does our community. We are all proud of this big beautiful beast!" Weekend pass available for $120 CAD regular pre-sale with camping included in ticket price. Weekend of festival, the weekend pass will be $160 CAD at the festival gate. Day pass will be available at the festival gate only for $70 CAD. Camping is an additional $20 CAD for day pass per night. Please visit THIS LINK for details and purchase. Be sure to also grab your 2016 AMF Free Digital Sampler, featuring over 90 minutes of headbanging tracks from bands on the 2016 line up, HERE.